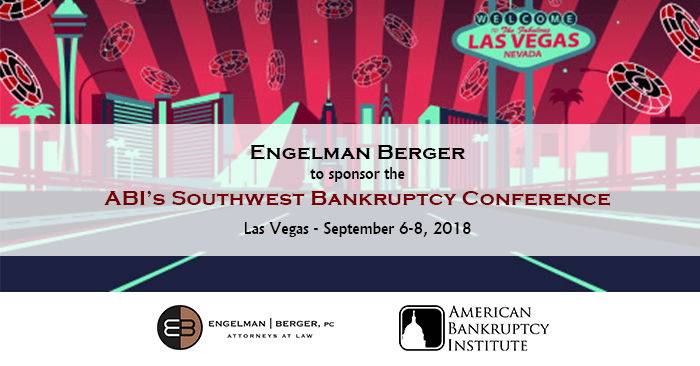 Attorneys and judges from around the Southwest will gather for the American Bankruptcy Institute 26th Annual Southwest Bankruptcy Conference on September 6-8, 2018 at the Four Seasons in Las Vegas, Nevada. Engelman Berger will be a sponsor of the event during which experienced practitioners and regional judges will present workshops on both business and consumer insolvency related topics. The conference will feature 12 panels focused on a variety of topics including: how to handle challenging clients and conflict issues in individual cases, the ins and outs of dealing with tax claims, post-confirmation liquidating and litigation trusts, and more. Patrick Clisham, Managing Shareholder of Engelman Berger will be moderating the Judicial Roundtables panel at the conference. During the Southwest Bankruptcy Conference, there will also be two social events where participants can spend time together: a Golf Tournament at the Royal Links Golf Club and a Jerry Seinfeld show at the Colosseum at Caesars Palace.